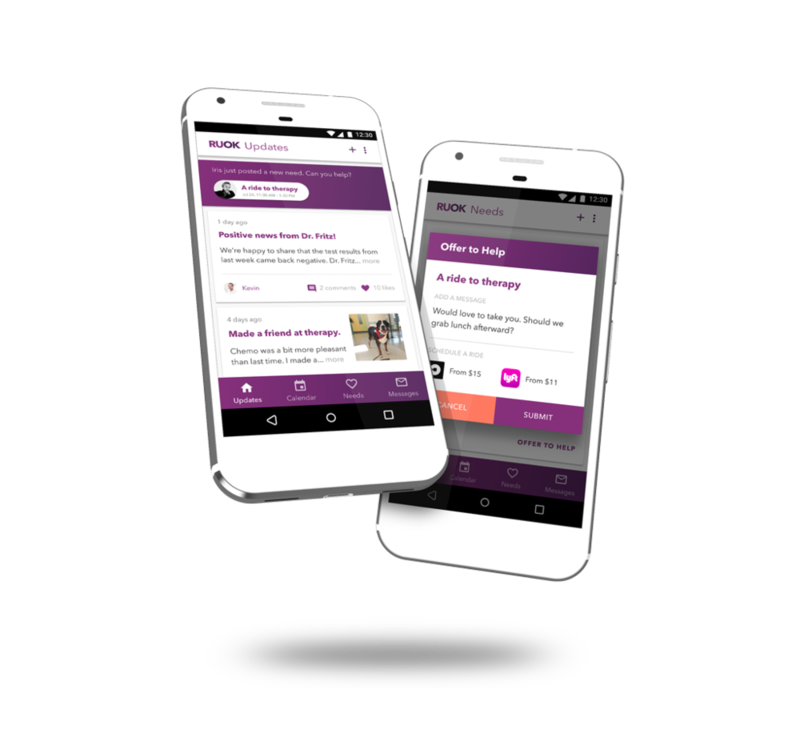 RUOK is an app that helps families support each other through long-term illness. Emotional dimensions of long-term illness. Four years ago, my mother-in-law, Susie, was diagnosed with an autoimmune lung disease. Since then, she has relied on oxygen tanks to support her breathing twenty four hours a day. Her condition is unstable and unpredictable, and at multiple occasions she's been hospitalized. For the past year and a half, she's been listed for a double lung transplant. She got close once (as close as laying on the operating table), but the donor lungs were not in good enough condition. The surgery was aborted, and the family is still waiting. Long-term illness is hard on families. Emotions and expectations complicate relationships. Patients depend on the support of their loved ones while not wanting to become a burden; loved ones want to be there for their sick family member while having to resume their lives outside of the illness. Feelings of guilt, shame, and self-blame get in the way of coping, for the patients as well as the support networks around them. Designing for users you love. My mom (left), visiting from Sweden, and my mother-in-law (right), welcoming her extended family into her life. Getting to know the people involved. I conducted over a dozen interviews with people that have either primary or secondary experience of long-term illness. I talked to patients, survivors, family members, friends, caretakers, and medical professionals. Based on these conversations, I defined four user groups and crafted a persona for each group. How might we help families ask for help? When looking at the needs and pain-points of each persona, an insight emerged: patients, their families, and the people around them all struggle to know how to ask for and offer help. A heavy burden falls on caretakers and household members, ultimately taking quality time away from them and the person they risk losing. 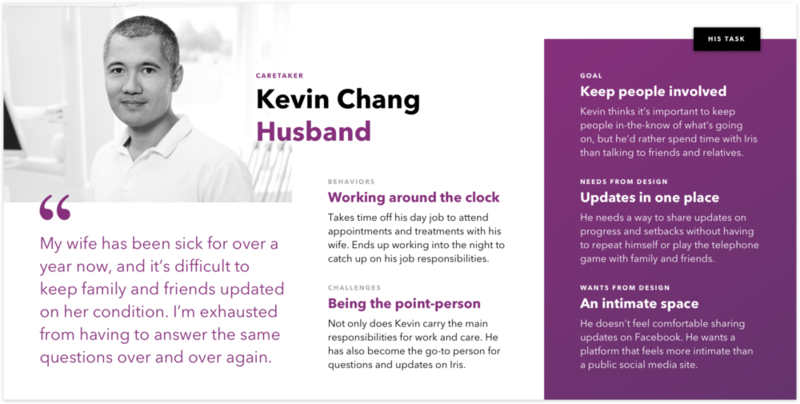 I decided to build a concept around this insight and imagined two task flows based on two of my personas. Using the task flows as my guide, I sketched user flows and wireframes. I grounded myself in the main goals of my target users and focused on key moments, elements, and interactions. Before investing too much time in screen design, I wanted to validate the product's value to its audience. I created a series of low-fidelity mockups and used them as conversation starters with potential users. These discussions revealed some important insights and helped me define features and refine functionality. Brand identity and visual language. Next, I created a brand name—RUOK (pronounced "Are you OK? ")—designed a logo, and established a visual language for the app. Based on feedback from the first round of prototyping and testing, I created high-fidelity screen mockups. Using InVision, I created a clickable prototype for a second round of usability tests.